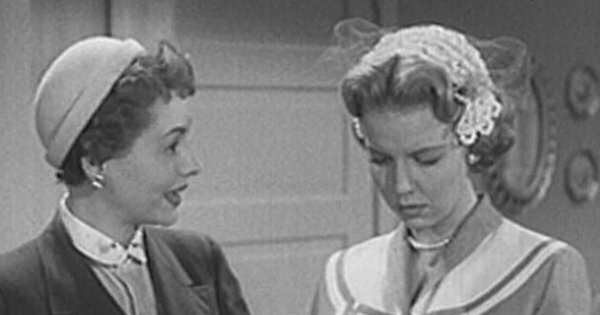 Sally Fraser and Jil Jarmyn starred in this unsold sitcom pilot from 1955 as two aspiring actresses living in Hollywood. This half-hour sitcom pilot was just one of several television projects Republic Studios hoped to get on the air during 1955. The movie studio set up a subsidiary, Hollywood Television Service, in 1950 to distribute its films to TV. A second subsidiary, Studio City Television Productions, followed in 1953. The first TV series produced by Studio City and distributed by Hollywood TV Service was Stories of the Century, which debuted in syndication in the spring of 1954. In August 1954, Broadcasting*Telecasting reported that 26 episodes of Stories of the Century had been completed by Studio City and another batch of episodes were being prepared, while a TV series called That’s Hollywood was also in the works . According to The Billboard, Hollywood TV Service announced in December 1984 that it hoped to distribute (likely via syndication) a total of four filmed TV series in 1955: Stories of the Century, That’s Hollywood, and “two as yet unannounced dramatic programs” . By April 1955, That’s Hollywood had been renamed Behind the Scenes and Hollywood TV Service had decided to try to sell the series to a network rather than syndicate it . An article about Republic Studios president Herbert John Yates published in the April 11th, 1955 issue of Broadcasting*Telecasting noted that two episodes of Behind the Scenes were completed and it was one of four TV series being readied for the fall . Sally Fraser starred in the Behind the Scenes pilot as the somewhat naive yet impulsive Sally Smith. Jil Jarmyn played her more level-headed friend and roommate Jill Butler. Both young women were living in Hollywood, hoping to become actresses. Lizz Slifer played Mrs. Fackert, who ran the apartment building where they lived. In the pilot, after a famous Hollywood writer moves into the apartment next door, Sally decides she’s going to write a story and sell it to a movie studio for $150,000. She does write a story, which is then accidentally swapped with that of the famous writer, and it ends up in the hands of a studio president who loves it. Sally manages to convince the studio president to buy the story for $150,000 and hire both her and Jill at a weekly salary of $2,500 to write the screenplay. The girls go on a shopping spree to celebrate their good fortune. Of course, everything eventually falls apart quickly and Sally’s actual story turns out to be worthless. Also appearing in the pilot were Jesse White, Paul Harvey, Addison Richards, Olan Soule, and Ian Keith. Hollywood TV Service screened the Behind the Scenes pilot in May 1955 at the National Association of Radio and Television Broadcasters convention in Washington DC . The series, with two completed pilots, was included in a list of new TV film programs published in the July 11th, 1955 issue of Broadcasting*Telecasting . Behind the Scenes was one of six TV shows from Hollywood Television Service advertised in Television Magazine‘s September 1955 issue . The others were Commando Cody: Sky Marshal of the Universe, Adventures of Dr. Fu Manchu, Stories of the Century, Stryker of Scotland Yard, and Frontier Doctor. Of the six, Behind the Scenes was the only one that never made it past the pilot stage. Hollywood TV Service was apparently unable to find a network for the series. In fact, with the exception of Commando Cody, all of its TV series were syndicated. It’s unknown whether the company attempted to syndicate Behind the Scenes when it was unable to sell it to one of the networks. In December 2013, Alpha Video released the Behind the Scenes pilot on DVD alongside episodes of The Beulah Show, The Ruggles, and Peck’s Bad Girl. 1 “Republic Planning $3 Million Expansion.” Broadcasting*Telecasting. 23 Aug. 1954: 31. 2 “Distrib Expansion Plans Aired by HTS.” The Billboard. 18 Dec. 1954: 4. 3 “No Syndication for ‘Fu Manchu,’ ‘Scenes’; Eye National Sale.” The Billboard. 2 Apr. 1955: 4. 4 “Our Respects to Herbert John Yates.” Broadcasting*Telecasting. 11 Apr. 1955: 22. 5 “The Billboard 1955 NARTB Convention Spotlight on TV Programming Opportunities.” The Billboard. 28 May 1955: 14. 6 [Advertisement] Television Magazine. Sep. 1955: 8-9.